What evidence is there that the United States war to suppress Vietnamese independence began “in good faith by decent people”? Is it simply that we are decent people, so, if we do horrible things, than it must be “out of fateful misunderstandings, American overconfidence and Cold War miscalculation”? And, if politicians from both political parties continued these atrocities, doesn’t it mean that both political parties are united in their militarism? Other tidbits from the first 30 minutes which worry me are the 1945 accidental killing of A. Peter Dewey, a U.S. intelligence officer who had recommended that the United States withdraw from Southeast Asia; Ho Chi Minh’s letters which never reached Woodrow Wilson or Harry Truman; De Gaulle’s threat to join the Soviet bloc if the United States didn’t help France maintain its colonial empire; and the purges Võ Nguyên Giáp undertook of non-communist factions in the Vietnam independence movement which Ho Chi Minh was in France attempting yet again to win Vietnam’s independence through negotiations. While each of these incidents is titillating, we can’t treat the US decision to support the South Vietnamese government with half a million soldiers who conducted a brutal counter-insurgency campaign and horrific air raids into North Vietnam, Laos and Cambodia as a tragedy, which, without unusual circumstances, could have been avoided. The United States’s brutality in Vietnam is not Romeo and Juliet, where a message delivered would have enabled the two young lovers to live in happiness. The United States intervened in Vietnam and escalated, at great cost to the peoples of the region and the poor and vulnerable here at home and the common soldiers and their families, because the United States is an empire and is militaristic. While I don’t expect PBS and Ken Burns to agree with this, I hope the series will have some scenes which at least consider this possibility. During this narration, the viewer sees images which correspond with the text. When the video is no longer available on line, you can still see these in a Flickr album I’ve created. The 3rd and 4th images are subtly subversive to the narrative. 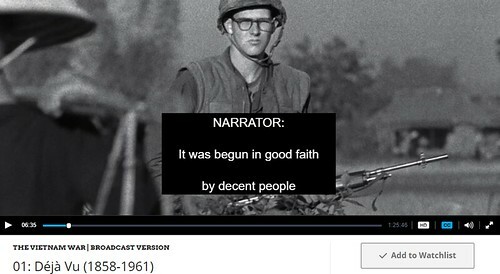 This image, paired with narration “it was begun good faith by decent people,” leads one to lend that description to the pictured US soldier (who of course did not begin the war). When the film displays the entire image, the soldier is seen guarding (or threatening) distressed Vietnamese villagers. P.S. I should mention that the first episode does note a transition in the thinking of John F Kennedy from sympathizer with Vietnamese nationalism to anti-communist militant. Others also took exception to the first episode: John Pilger & Bruce Dixon of the Black Agenda Report. Todd Gitlin had nice things to say about it. This entry was posted in History, TV and tagged Documentary, History, Ken Burns, PBS, Public Broadcasting Service, United States, USA, Vietnam War, VietnamWarPBS. Bookmark the permalink.